I hope everyone had a Merry Christmas, my time with family was fun and refreshing – it won’t be long now before we get to start 2009! Any predictions? I’d like to hear yours, so please comment below if you feel inclined. For what it’s worth, I believe ’09 will be very disappointing for those looking to put a good and lasting end to our current economic woes. In fact, 2009 will be the year of realization by the majority of people over how corrupt and out of control our system rally is. It’s that realization that will eventually begin wave ‘C’ down, but our eventual lows will not occur in 2009, just as they did not occur in 2008. Deflation will remain the theme for most or all of 2009, those who hold cash will still be king, and those with the gold get to make the rules as usual! I’ll write a more comprehensive article on my thoughts about 2009 soon. Today the DOW finished up 47 points, the SPX was up .5%, the NDX gained a small .1%, and the RUT gained the most with a 1.3% advance. Two news items set the stage for today; the first was that GMAC won approval from the Federal Reserve to become a “bank” which will allow it to offload a lot of its bad debts onto the taxpayer. So, instead of those bad debts being defaulted upon through the bankruptcy process, they will eventually become a part of the indebtedness of America. Words cannot describe how screwed up that is. The other news is that multiple reports are showing that this retail Christmas season is one of the worst on record. No surprise there, and not to be a Scrooge, but if never ending sales growth over Christmas is your goal, then that only goes to show how screwed up that is as well. Speaking of never ending growth, I think I’m going to post that great video series by the good Dr. Bartlett – “The Most IMPORTANT Video You'll Ever See.” That’s a great video. If you haven’t seen the entire 8 parts (about 10 minutes each), you should take the time this weekend, it’s worth it and will help you understand the math behind our never ending attempt to inflate the economy (impossible). At any rate, the technical landscape has not changed much at all over the past couple of days. Volume has been VERY low, so it’s difficult to get a reliable read, that’s part of the problem with holiday weeks, and why I chose not to play at all the past couple of sessions. We finished overbought on the 10, 30, and 60 minute stochastic fast, but the slow shows there could still be a little more upside in the very short term, but that condition points to lower prices sometime early in the week. 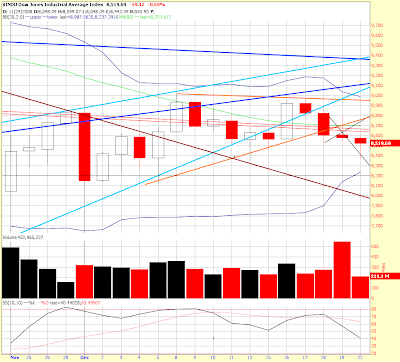 I’m going to put up just one chart today, and that’s of the DIA (DOW ETF) 3 month daily. Yes, the past two days have been the lowest volume days of the year. Note the volume pattern though, higher volume on sell-offs, diminishing volume on advances or even sideways moves. Also note how small the range was on the past two days – not even worth mentioning, other than that type of action brings the volatility indexes down. 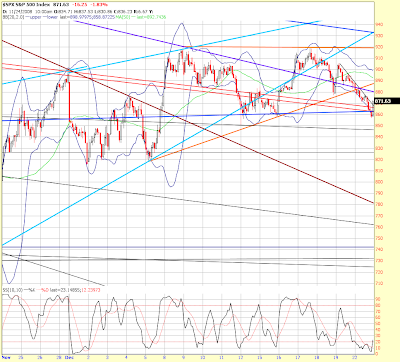 It also bought time and you can see that it allowed the daily fast stochastic to level off right on the oversold line. The slow needs to most likely come down some more before the next significant run higher. Also note how the Bollinger bands are narrowing down on each other. That Bollinger squeeze usually means that a sharp move is coming pretty soon. I also drew in yet another new potential triangle (green). We’re right in the middle of a turn window and I expect that as volume begins to pick up after the first of year that the medium term trend will become clear. Overall we’re still in the same old range, but end of year seasonality means that we could easily continue to drift higher until we’re into January. I think we have another eye opening year ahead in 2009, it’s probably wise to take this lull in activity to recharge your batteries. The economy impacts people’s emotions and psyche – it’s draining regardless of whether the headlines directly affect you or not. Have a good evening and weekend. I’ll be back at writing and posting interesting material now that Christmas is behind us. His explanation is entirely correct... the problem is that the people, "the Market," is already debt saturated. Futures were down all night long but sprang back to life this morning and are now basically flat. We have entered a time where we have two turn dates clustered inside a week of time – one today and another on the 28th. I am uncertain how that will play out, sometimes when turns are grouped together they act as a single turn, or it could be that we go higher for a few days and then start another leg down… that adds to the uncertainty in this case. The number of people filing unemployment claims rose to the highest amount since 1982, the figure jumping to 586,000 for the week. How do you fire up an economy that’s losing jobs at that pace? Answer is you don’t. The economy must work through the misallocations; it will take time, lots of it. NEW YORK (CNNMoney.com) -- In a troubling sign that consumers are retrenching this holiday season, consumer spending and orders for durable goods fell further in November, according to government reports released Wednesday. A Commerce Department report showed spending by individuals fell 0.6% last month, after falling 1% in October. It was the fifth consecutive monthly decrease. Economists surveyed by Briefing.com had forecast a 0.8% drop. Personal income fell 0.2% in November, following a 0.2% rise in the previous month. Economists had forecast no change. The report also included the so-called core PCE deflator - a key reading closely watched by the Federal Reserve that measures prices paid by consumers for goods and services other than food and energy. It showed a 1.9% rise from year-earlier levels, below the 2% posted in October. A separate report released by the Census Bureau showed orders for durable manufactured goods declined a seasonally adjusted 1% to $1.9 billion in November. Last month's decline was narrower than the revised 6.9% drop in October and the 3.1% drop forecast by economists. Technically, we had 5 down days in a row, albeit small ones. The stochastic on the short time frames indicate a rally or sideways action is needed and today is a turn day. Also, the number of stocks above their 5 day moving average is almost zero (3%) which is usually a place where bounces occur from (although it’s also where large oversold sell offs come from). I am currently market neutral until after the holidays. I think the Bloomberg article carrying talk of Japanese debt forgiveness is a sign of things to come. That’s simply a polite way to say default. Why would Bloomberg even carry such a piece? Perhaps it’s a stab back at Paulson who will not release information on the way TARP money (your money) is being spent. Our government does indeed need to lock Paulson and crowd behind bars – this crisis will NOT subside until debts are cleared and an honest/transparent form of government is substituted in its place. On that light note, this is my last update until after Christmas. It’s snowing again in the great Northwest. I hope you have a happy, safe, and pleasant holiday and we’ll be back at the markets’ edge again soon. Evidently the Japanese know how to do math better than our own officials… Perhaps we’re closer to national debt default than most people thought? People have been ignoring what I’ve repeatedly said about the math. It’s coming in some form, as the debts that the banks should have been forced to default upon were forced onto the public roles. That debt cannot be serviced and will be defaulted upon at some point. Working around the debt or deflating it away will not work. This statement should be taken very seriously. How will our other debt holders react to such a proposal? Who will finance our future debts once we have defaulted? Still think this is a great monetary system? Not me, and we need to get busy coming up with solutions that will work over the long haul, not just to some Wall Streeter’s next bonus. Future solutions must work for the people, not the central bankers who have NO BUSINESS being in control of America’s finances. Dec. 24 (Bloomberg) -- Japan should write-off its holdings of Treasuries because the U.S. government will struggle to finance increasing debt levels needed to dig the economy out of recession, said Akio Mikuni, president of credit ratings agency Mikuni & Co. The U.S. budget deficit may swell to at least $1 trillion this fiscal year as policy makers flood the country with $8.5 trillion through 23 different programs to combat the worst recession since the Great Depression. Japan is the world’s second-biggest foreign holder of Treasuries after China. I know it's marketing, but it's just fun! Have a Merry Christmas! The DOW finished down exactly 100 points or 1.2%, the SPX closed down 1%, the NDX down .5%, and the RUT led the decline by losing 1.4% on the day. Well, what can we say about that action? This morning the short term stochastic indicators were saying rally, then more terrific housing data and next thing we know we have the fifth down day in a row. I duly note that each of those down days came AFTER our wonderful Fed lowered interest rates to zero. Hey, rates were already at zero, the rally off the announcement was entirely the hopes and dreams crowd tossing their money to the fiat gods – God bless their little hearts! They probably still believe in Santa, too. It’s too bad they didn’t study math in elementary school! But hey, we now have an economy and government where there is simply NO MORE CREDIBILITY. All the hype, all the lies, all the corruption are becoming apparent. Today a key $1.4 billion Madoff fund manager was found dead, wrists slashed: http://dealbook.blogs.nytimes.com/2008/12/23/head-of-fund-invested-in-madoff-said-to-commit-suicide/. Yesterday a top HSBC banker was found hanging by his belt in a 5 star hotel room. These are on top of many other such bizarre occurrences in the past few months. Don’t think this is anything like the 1930’s? The credibility/confidence game is all important in a fiat world. Kunstler wrote a good article about it yesterday, you can find it here: http://jameshowardkunstler.typepad.com/clusterfuck_nation/2008/12/legitimacy-dwindles.html. Also, Karl Denninger has been writing some good articles on the subject which you can find here: http://market-ticker.denninger.net/archives/695-Were-All-Madoff.html, and here: http://market-ticker.denninger.net/. What do you think? Think it’s time to invest for the “long haul?” Ha, ha… Not until ALL the garbage has been taken out to the curb! We’ve just gotten started. The reality is that the math doesn’t work. Look at our government on all levels… Their revenues are falling dramatically while their spending demands are increasing exponentially. An example of the shortfall came today when it was announced that Boeing probably won’t be seeing about $900 million in contracts for their latest B-737 sub chaser. And the DOW goes down… see how that works? Fifth down day in a row, today was even lighter volume than yesterday, which we expect for a major holiday week. Look at the 3 month daily of the SPX below. Note that once again we are drawn to the 860 old blue triangle magnet line, but fail to close underneath. That line is now coincident with the dual red lines that make the neckline of the inverted Head & Shoulders pattern. I don’t like that pattern as much anymore because the right shoulder is just getting too drawn out in time. Again, the 50 day moving average is descending and we can not stay above it. 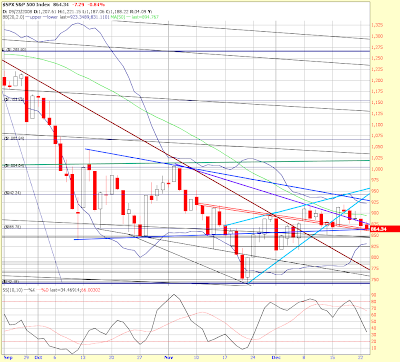 Note that the daily stochastic fast is rapidly approaching the lower end, but the slow has quite some time to go. On the next chart we see a 10 day, 10 minute chart of the SPX. Here you can clearly see the support being offered by the 855 to 865 area. On this time frame that has produced a pretty clean looking H&S pattern with the lower blue line now the neckline. This pattern is unconfirmed, we would need to break beneath 855 or so to confirm it. 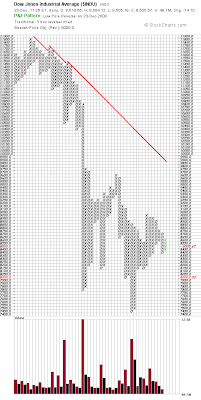 Once confirmed, this pattern would target the 800 area on the S&P. The 800 area is dangerous as it’s beneath the current lows in the 820 area and there is little support between there and 750. I still think the odds favor a turn higher prior to the old lows which would be in keeping with wave B. Again, my confidence in what’s happening is low… thus my inclination to play small or not at all until a clear pattern develops with a wave count I like. Also note on that 10 minute chart that it looks like 5 clean waves down from the 917 “head.” That would indicate some type of upside or sideways action may be necessary before that neckline is broken. It’s also possible that we just go higher from here as a close on this support is dangerous, especially with the 20 and 60 minute stochastic still in the lower ranges. That small H&S pattern is in place on all the indices but is less developed on the transports and in the RUT. 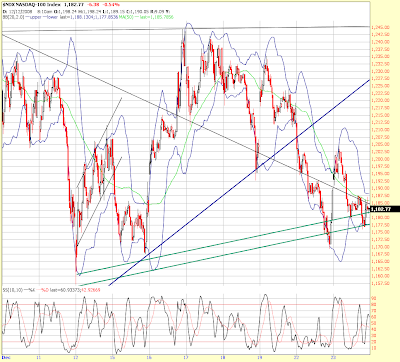 Below is the NDX, I have drawn in a double green line to represent the potential neckline there. While this is a small pattern, it is nothing to sneeze at. A break below the neckline would confirm the pattern and the target would be about 1,100ish, a 6.5% further decline. Note here that the 10 minute stochastic still has some room on the downside. Next, let’s take a look at the VIX. This is a 3 month daily chart. Note that we went down this morning, but came back pretty strong in the afternoon and posted a bullish candle that managed to close above the line of support/resistance offered by the early November candle stick bottom and lower Bollinger band. Also look at the stochastic here, just about to produce a buy signal if there’s just a little bit more upside. So, to summarize I still see a mixed picture. Potential inverted H&S, potential short term regular H&S, buy signals on weekly’s, sell signals on daily, falling VIX that may be bottoming… that’s a lot of crosscurrents and maybes – too many to bet large. It is the holidays after all, some argue a good time to make money off the light volume, I say a good time to keep what I have. Speaking of the holidays, tomorrow is Christmas Eve and the markets will close at 11:00 AM Pacific or 2:00 PM Eastern. The morning update tomorrow will be my last until after Christmas as I will be visiting relatives. Tomorrow morning we’ll get the latest weekly unemployment report along with durable goods orders and I’ll pass those along before I go. The markets are continuing lower so far this morning, not recovering since this morning’s economic data. Below is a series of Point & Figure charts that are generated electronically. 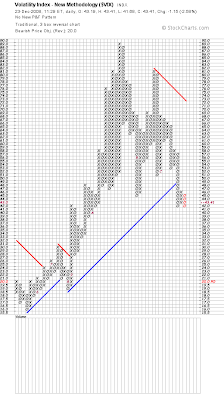 I use these P&F charts to help identify key breakouts or breakdowns and to provide initial targeting data. This morning’s action has produced “low pole reversal” signals on most of the major indices. They have all generated targets in approximately the same range, the DOW target being about 8,000 and the S&P about 810. The intraday action usually will not change these reversals or targets as once the technical level has been breached, it’s been breached. Spotting these breakdowns is not always as easy on a candlestick chart, but yesterday you will note that I pointed out breakdowns below the most current uptrend lines. These charts now are confirming that. But I use caution with these charts as the other technical indicators are not in full agreement. Look at the VIX for example. It has broken down and has a target (computer generated) of just 20. The VIX going down further does not coincide with a fairly large move down in equities, although I note that is exactly what’s been occurring the past few days – the VIX has been going down at the same time equity prices are falling. That makes your choice of investment vehicles important. Using options with a falling VIX is not wise, but buying them after the VIX has fallen is terrific. In the mean time direct shorting or the use of futures is probably a better option. 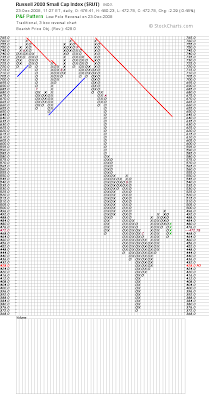 Now, before you see these P&F targets and jump on the short bandwagon, keep in mind that the daily fast stochastic is now getting close to oversold and also that in the very short run the 60 and 30 minute slow stochastic have a ways to go before they get to an area where they would normally roll over. 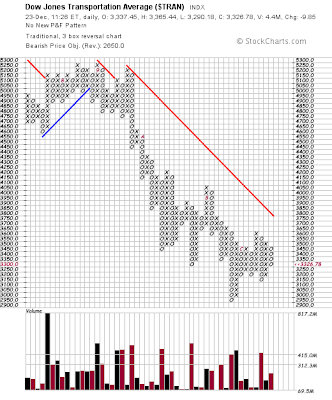 Right now the RUT looks weakest which is typical of declines. Right now I’m short, but very small, I’m still being protective as I know that there are still many crosscurrents, but I may add another small short position as the stochastic gets back up into the overbought range (if they make it there). There is a cluster of turn dates between now and the New Year, so any positions will be short term and I will be nimble. Existing home sales fell more than forecast by 8.6% in the month of November. Purchases of new homes fell 2.9% in the same period and both reports show record price declines over the past year. This news has sent the markets lower, once again demonstrating how difficult it is for the market to make headway in the face of a constant stream of negative economic data. I would actually contend that the markets are divergent from the data in the fact they have held up for the past 3 months. I believe that to be a technical condition that will not last. NAR and other “sales” oriented people (almost everyone now in our economy) have been saying over and over how this is going to turn around and that demand is “pent up.” I’ve been saying all along that the only pent up demand is that of the sellers who would like to sell but can’t. Thus, I believe that the trend in housing will continue as there is a “shadow” inventory that is just waiting to list at the first sign of stability. I also note that this phenomenon is putting a damper on job mobility. Those who may have sold in the go, go days of real estate are now maybe stuck and thus their mobility is limited. I have been expecting that some of the major homebuilders would fail outright, and while some of the mid-tier builders have gone out of business, the very largest have not. I believe that will change once we get into wave ‘C’ down, that’s where the businesses who are hanging on and “hoping” will be forced to concede defeat. Their credit long since cutoff, it’s only a matter of time. Equity futures are flat so far with about 45 minutes to the open. Third quarter GDP was revised mostly flat at -.5%, which matched estimates. Some internal components where revised down slightly like Consumer Spending which was revised down .1%. Just a reminder that our GDP numbers in no way, shape, or form reflect reality. They are hedonistically adjusted as the inflation “deflator” introduces every error that is contained in our now convoluted inflation data. Therefore, comparisons to history are not valid, and because of constant changes and adjustments are not even that good as a quarter to quarter comparison. While I’m on that subject, a lot of people are looking at the spike in the money supply aggregates and are getting all worried about re-inflation. Those money aggregates do not capture the destruction of credit and wealth that are occurring, just as they did not capture all the false credit that was created by the Shadow Banking System. In other words, they also do not reflect reality or provide any useful or usable information. True transparency is NOT allowed, witness the fact that Bloomberg and now FOX are having to sue the Treasury to gain information about how the TARP money is being spent. Well, there will be no true transparency as long as the criminals are still running the show. True transparency would put their businesses down and expose them for the crooks that they are – thus it’s not going to happen until the entire system comes unglued which is going to happen sooner rather than later. Year over year corporate profits were reported down 10.1% this morning. 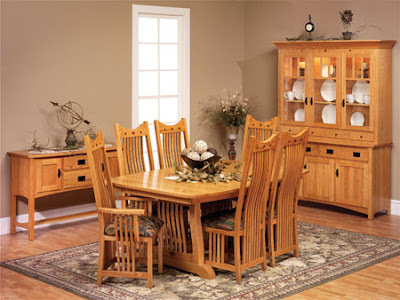 Consumer Sentiment, New and Existing home sales figures are released at 10:00 AM Eastern time this morning. There’s much debate raging about where we are on a technical basis, especially Elliott Wave count wise. It’s just not clear at this juncture, but my best guess is that we are still in wave B up/sideways. Some are saying we are in wave 4 and that 5 down will follow. That doesn’t work for me on a time basis, wave 4 would be out of proportion on the long side, but it is definitely still possible. That’s the thing about EW, it doesn’t forecast the future, it only eliminates certain possibilities by following its rules. Once you eliminate some possibilities, it’s useful because then you can weigh the odds of the remaining possibilities. In this case if we’re in wave ‘B’, then we should see more rally before the next major leg down, but if we’re in a wave 4 then we may not and we may begin the next leg down soon. That is what is creating the uncertainty now, and if you’re betting on one outcome over the other, all I can say is that I hope you’re betting small and not betting the farm. Here’s a 3 month daily chart of the SPX with all my drawings turned off. Note that we are still exactly where we were on October the 10th. In fact, just about the last month has been spent inside the confines of that one day’s candlestick. Why is that? Well, there are several very long term support lines in this area and there is also a cluster of Fibonacci lines in here as well. We were very deeply oversold when we landed here and we’ve been taking a breather ever since. Meanwhile we have been unable to get above and stay above the 50 day moving average and now we have a sell signal on the daily stochastic but that’s being countered by the buy signal on the weekly timeframe - I note that the DOW is very close to a buy signal on the monthly as well. Nothing moves in a straight line. Corporate earning do not, and will not in the future support the price levels where we are now. The market will seek its equilibrium and that is much lower than here. Our government’s reckless spending will NOT support the REAL economy. In fact, their actions are the crushing blow that sends us way over the edge. 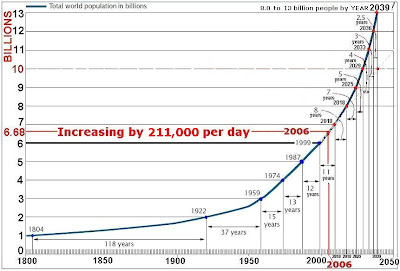 The math didn’t work before, that’s why the parabolic economy turned negative to begin with, now they are making the math work even more against us and speeding us to our eventual destination which is the fiat scrap bin of history. Hey, I’m just the messenger, don’t shoot. For the day, the DOW lost 59 points (after being down more than 200), the S&P lost 1.8%, the NDX was down 2.3%, and the RUT also gave back 2.3%. GM and Ford debt was downgraded which sent GM stock down 22% on the day and Ford down 12.2%. Several of the key financials were put on ratings watch over the weekend, and that, too, put pressure on the financials. The volume was lower across the board, and I do note that the past 4 sessions of decline have come on progressively weaker volume. 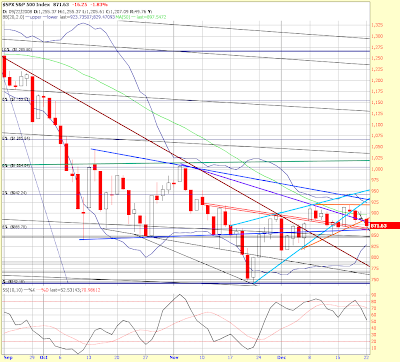 Overall we are still stuck in the same old range, but several indices did break their recent uptrend lines. Let’s start by taking a look at the 20 day 30 minute chart of the SPX… note that once again we arrive at and bounced off the old dark blue triangle bottom in the 860 area. We have been in this exact same area for nearly 3 months – that’s the line that keeps acting like a magnet for prices. Also note that we are following the twin red lines (inverted H&S neckline) downward. On the shorter timeframes there’s also a potential H&S pattern that is not confirmed as the neckline has not been broken. While were here, also note that the 30 minute stochastic is coming up out of oversold after just producing a buy signal on the late minute climb. The 60 minute stochastic is still oversold, and the 10 minute fast is climbing rapidly, but the slow is just leaving oversold. This argues for some advance in prices, probably tomorrow. Next, let’s look at a 3 month daily of the XLF (financials). Note that we have a clean break of the latest uptrend line and possibly triangle. Also note the declining volume. 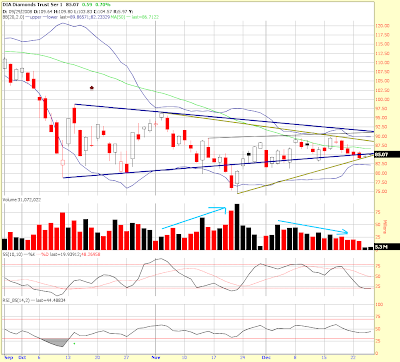 That is a mixed picture, I would feel a lot more confident about future declines if the volume was confirming here. 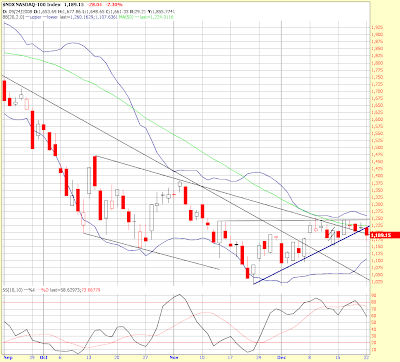 Note, too the sell signal is still in force on the stochastic with lots of room for further declines. 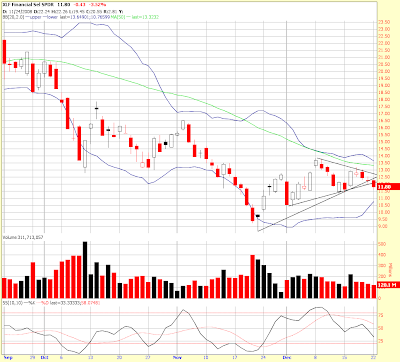 This next chart is a 3 month daily of the NDX, it has the same chart pattern as the XLF. 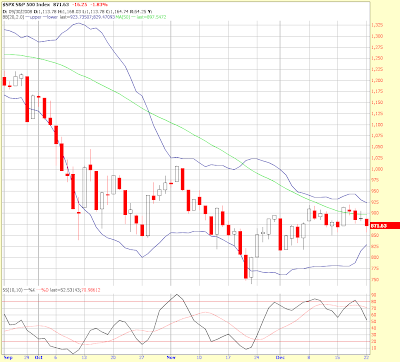 It also has a fresh sell signal on the stochastic and it also failed to breach the 50 day moving average. Now let’s look at a 3 month daily of the SPX. You can see how the candlestick was turned into a near hammer by the late day rally. You can also more clearly see the 860 area is the bottom of the old triangle. Lastly is a quick glance at a 1 month daily of the DOW. That’s also a near hammer that would portend higher prices ahead. I say “near” because of the pip on the top. It still could be a reversal signal and would need confirmation tomorrow. Since I don’t see the same thing on the other indices as strongly, it’s in question. Here you can clearly see the lower volume as we get closer to the holidays. Again the daily sell signal on the stochastic leaves room for more decline, but we are getting close to the bottom Bollinger band. Elliott Wave count wise, it’s difficult to tell exactly where we are. My best estimate is that we are in wave ‘b’ down of the larger wave ‘B’ up/sideways. If that’s true, we should not break the previous low at about 7,500 on the DOW, and we should go on to likely make a new high for this trading range. That count is not a lock, that’s why I’m still playing small. I will repeat this; so far this “Santa” rally has been nothing but weak, weak, and more weak. The 920 S&P level has been impenetrable so far. TLT went down a little today and I exited half my position as it hasn’t made the sharp reversal I was looking for as of yet. Another leg higher is still possible. The VIX closed down a little today, I note that once again it is declining at the same time the market is – that is certainly not the norm, but does show that volatility is decreasing from previous stratospheric levels. A lot of economic data comes out in the morning. With light volume it should be interesting. Again, short term stochastic says advance is possible tomorrow. The DOW is currently down 82, the SPX is down 1.8%, the NDX is down 2.4%, and the RUT is leading this morning’s decline, down 2.6%. 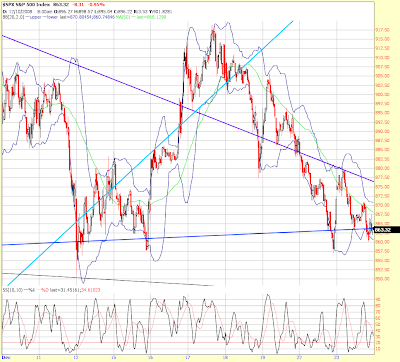 Note that the 30 minute stochastic is oversold, so are the 60 and 10 minute time frames. Very little impulse behind the decline and the volume is pretty low so far. The same trendline on the other indices remains in tack. Also note that the NDX made a lower high just prior to this decline – the other indices did not. The VIX is down which makes options difficult to use here as the declining intrinsic value offsets any gain from a puts’ rise in value due to underlying price decline. TLT is now well off its highs, but again, playing with options is difficult here. In addition to falling IV, the spreads on puts are astronomical, especially anything beyond the front month. I view this decline as most likely corrective, that is I don’t believe it is likely to produce a new low. That’s what the VIX and price action look like so far, of course that can change, but I doubt it on such low volume. The other thing to watch here is the XLF (financials). Their price action has created a triangle that looks like it should break down, but it may just bleed out sideways. 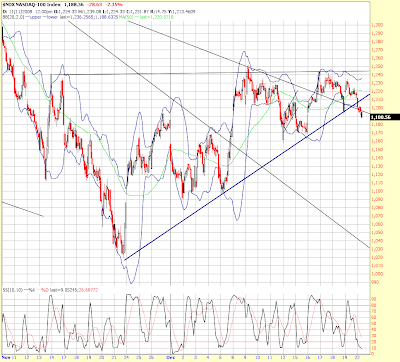 Again, the NDX and RUT are weak looking, but I don’t see any sign of imminent breakdown barring breaking news. From now until the New Year, trading volume will obviously be light and there will be holiday closures and half sessions. Expect fewer updates unless conditions warrant. With about a half hour prior to the open the DOW is down 40 points and the SPX is down 4. No significant economic data today, but tomorrow will come final GDP, Redbook, Store Sales, Consumer Sentiment, New Home Sales, and Existing Home Sales. That’s an unusual amount for one day. Wednesday brings Purchase Applications, Durable Goods Orders, Jobless Claims, and the Petroleum Report. The markets are closed on Thursday, Christmas Day, and it looks like 2:00 PM Eastern closes on Wednesday and Friday. Toyota forecast its first full year loss in the 71 year history of the company. I note that the middle/longer end of the bond market is moving down in price slightly this morning, gold is higher, the dollar is down slightly, and otherwise the technical picture is pretty much as described in Friday’s End of Day report. Remember that we just triggered a sell signal on the daily stochastic but we have the buy signal on the weekly. In the short time frames we are oversold on the 10 and 30 minute stochastic, thus I would expect prices to be supported in the near term. 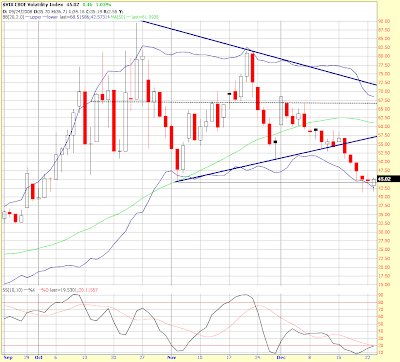 The VIX has been coming down and perhaps that will continue with some lower volatility sessions. That’s a good thing as it will make option prices come down. Have a good day, it’s a white blanket of snow here, the most I’ve seen in years for the Northwest! Good old British sarcasm… how the bankers are viewing this coming Christmas versus the people. Funny, but reflective of the mood. This is the type of mood change that should be paid attention to. The bailouts have gone to the banks and the wealthy, not the people. That can only go on for so long before you start to have problems, witness the recent rioting that’s been breaking out around the globe.